The State Department released this photo of Secretary of State John Kerry meeting with Palestinian Authority President Mahmoud Abbas today in Ramallah, amid reports Friday suggesting Kerry may be on the verge of announcing agreement on relaunching Israeli-Palestinian peace talks. Kerry extended his trip to the region Friday to meet with Abbas to see if he could overcome obstacles to resuming negotiations. Kerry's helicopter ride from Amman to the West Bank capital was delayed two hours while he made phone calls to Israeli, Palestinian and US officials Friday, the New York Times reported. The holdup is borders, analysts suggested. 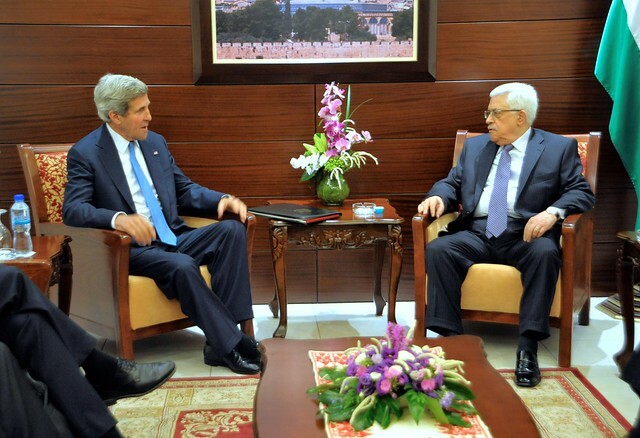 But signs from Ramallah Friday were that the meeting with Abbas was going well, according to Israeli media reports. Israel Channel 2 reporter Ehud Yaari, citing Israeli officials, reported Friday that Kerry was on the verge of announcing agreement on relaunching talks. This entry was posted in Politics, Security and tagged Abbas, Ehud Yaari, Israel, John Kerry, Jordan, Netanyahu, Palestine, Palestinian Authority by Laura Rozen. Bookmark the permalink.